When England’s King Henry VIII broke from the Roman Catholic Church in the 16th century, it was as if overnight an entirely new liturgy had to be created. Composers of the time had to write all new works, in a new language and a new style—even as some continued to practice their faith in secret. “The program is an exploration of musical responses to the change in religion and also the change in political leanings,” said Phillip Cheah, music director of Central City Chorus. 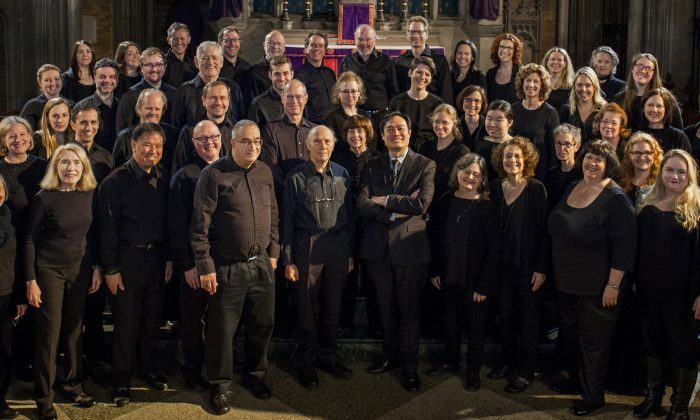 On March 9, the chorus will perform “The Tudors,” a program of music written around the time of the English Reformation, at the Saint Ignatius of Antioch Episcopal Church in Manhattan. We will hear from composers Thomas Tallis, Thomas Tomkins, Robert Parsons, John Taverner, and William Byrd. And though many of these composers were contemporaries, and the pieces all sacred music, the style of the programmed works will vary greatly. “They’re all Tudor composers, but they all have their own specific style, their own approaches to this new liturgy, and this new approach to setting music,” Cheah said. Instead of Latin, the composers now worked with English text. The liturgy was meant to be simplified, in vernacular, and accessible to the masses, and the music was meant to reflect that. Gone was the thick Latin polyphony, Cheah said. Henry VIII even wrote a letter with instructions that the songs were to set one syllable per note, so that what was sung could be more easily understood. “I wanted to explore what that meant for composers at the time,” Cheah said. The earliest of the works is an Easter piece by Taverner, which shows the complex polyphony of the music that preceded the Reformation. From Tallis, the well-known “If Ye Love Me” motet is “a perfect example of the very simplified style that the Reformation called for,” Cheah said. Tallis and his student Byrd were both composers for the Royal Chapel—and both were Roman Catholics. Despite that, the composers had very different styles. “I wanted the various pieces to have a conversation with each other,” Cheah said. From Byrd, the program includes his “Mass for Four Voices,” which is a Catholic Mass that had to be performed in secret. The Mass will be performed movement by movement, spread throughout the program rather than all at once. “We want to give a sense of how the Mass would have actually been heard if it were performed in public in a service,” Cheah said. The history surrounding these pieces may be complex, but first and foremost, Cheah programs music to be enjoyed. Even knowing nothing about the music or the history, one can sit in the concert and enjoy the experience. And sometimes, like Cheah saw during rehearsals, something clicks and you experience a piece of music in a new light because of what you heard right before or after it. He feels this happens for the audience too, but it might be more subliminal than conscious. Central City Chorus performs “The Tudors” on March 9 at 7 p.m. at the Saint Ignatius of Antioch Episcopal Church in Manhattan. Can Music Shape Your Soul?